At Superior Sharpening Services, full-service knife sharpening in Savannah, GA, we know that you use your knives more than any other kitchen tool. Whether your knife is forged, serrated, carbon steel, stainless steel, ceramic, laminated, Damascus, single-bevel or the only knife of its kind in the world, we will come to you so we can restore it to its original functionality. 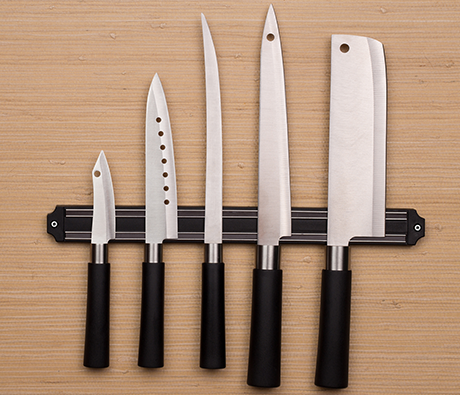 To make your knives sharper than before, we apply the 4-step Perfect Edge Sharpening System. First, we repair any defects. Second, we refine the relief angle using a blending wheel. Third, we apply the secondary bevel, or cutting edge, on a fine, rubberized silicon carbide abrasive wheel. Finally, we remove the burr (wire edge) and polish the cutting edge. The result is the strongest, sharpest, longest lasting, and most easily maintained edge available! In the case of serrated knives, we will sharpen the reverse side if the serrations are in good shape. If the serrations are worn out, we will re-serrate your knife, one scallop at a time, using specially profiled diamond-sharpening wheels. Contact us at 844.526.5206, today, for advanced knife sharpening, tool sharpening, and clipper sharpening in Savannah, GA, Bluffton, SC, and surrounding areas.